Advent begins with a call to vigilance as reflected in the passages above. There are numerous Scripture passages that call us to this vigilance and anticipation of the Lord’s coming; these are only a few. Being vigilant means, also, that we are prepared. We are not caught off guard. Imagine if Christmas morning came and you woke up suddenly realizing that you forgot to prepare! Imagine if you had no gifts, no food purchased and no plans were made. Of course you wouldn’t allow that to happen, but we do sometimes allow it to happen spiritually speaking. We often are not prepared to celebrate the birth of Christ within our hearts. The first week of Advent also offers the focus of the Second Coming of Christ. Jesus will return again, in all splendor and glory, to judge the living and the dead. We profess that fact every Sunday in our Creed. So, even though Advent is a time for the preparation of the celebration of the first coming of Jesus in the flesh, it is also a time to acknowledge that His first coming is ultimately fulfilled in His final glorious coming. As Advent begins, reflect upon how ready you are for Jesus’ coming. Are you preparing for it with the same fervor that you prepare for Christmas through shopping, cooking, decorating, etc? Are you looking forward to that day when He will return? Are you preparing for the spiritual celebration of His birth? Are you awake and attentive to the numerous ways that God speaks to you on a daily basis? If you find that you are not as prepared for His return in glory as you’d like to be, make this Advent a time when you get your heart ready. Commit to prayer, spiritual exercises, reflection and attentiveness to His gentle and glorious voice. Lord, as Advent begins, help me to put my eyes on You. Help me to open my ears to Your voice. And help me to open my heart to Your glorious presence. May I be attentive to You in every way You desire to come to me. Jesus, I trust in You. Subscribe to our daily Gospel Reflections via email! Thank you! Check your inbox or spam folder to confirm your subscription. God bless! Don’t Wait to Accomplish the Greatest Act! The World or Your Soul? What is God Calling You to Give Up? It Takes a Lot of Faith! The Lord’s Day is For You! With Whom Do You Associate? The Way Has Been Prepared…Are You Ready? Merry Christmas! Gloria in Excelsis Deo! 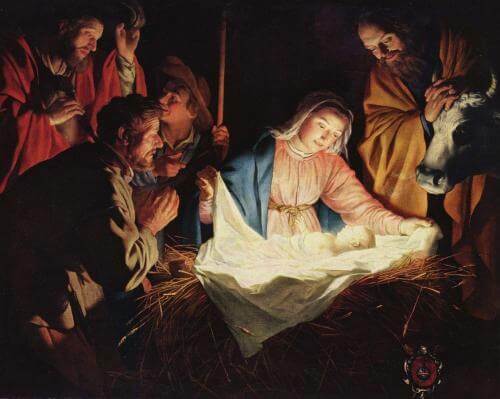 An Infant Rejoices in the Presence of the Lord! The Glorious Cross of Our Lord! Our Blessed Mother – The Queen of All Saints! Do You Want to be Rich? Transfiguration – The Glory of God! Most Blessed Are You Among Women! The Inner Life of God!